Providing products and/or services to businesses can be incredibly lucrative depending on the needs of the company. Unlike individual consumers, businesses are able to buy in bulk and spend a great deal more money on the goods that you provide. If you want to keep those high-paying business contracts, you need to provide an enhanced form of customer service. You need to demonstrate to your clients how much they mean to you, and the holidays are an ideal time to show your appreciation. 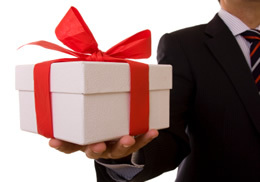 Perhaps your business doesn’t have a lot of money to buy gifts for your corporate clients. Small tokens of gratitude can go further than you may realize, and you don’t have to spend a lot of money. Sending custom holiday cards with coupons or discounts attached for “select” clients can keep your business in the minds of the client’s personnel. This not only shows the client that you’re thinking of them, but offering coupons and discounts could prompt additional services in the near future. However, you don’t want to make the same mistake many other business make when sending cards. It shouldn’t look like an advertisement. Adding a personal and customized touch can make the world of difference whether the card sits on a mantle or finds its way to the trash. A large box of mixed chocolates and nuts for the client to share can be a thoughtful gift especially if it’s delivered in time for a party. Many people have a hard time turning down treats especially during the holiday season. These gift boxes are usually cheap and can be as elaborate as you want. You may be surprised by how many goodies you can buy your client for less than $100. While this may cost your business a bit more money than what you have budgeted, sending branded promotional goods to your client can be appreciated while maintaining the presence of your company. However, you want to make sure you’re using promotional items that might actually get used. Branded letter openers may be nice, but items that are used on a regular basis keeps your company more apparent. Coffee mugs, niche items, storage devices and the like may see far more use than a letter opener or a stress ball. Much like the candy and snacks mentioned above, you can send over a few gift baskets for the staff of your client’s company. Gift baskets can contain a variety of goods depending where you bought it from. This is another gift idea that isn’t overly expensive but can be viewed as thoughtful by your client. The nice thing about gift baskets is that you can customize them to be unique. You don’t have to purchase a prefabricated item if you want to include specific goods. The holidays can be an excellent time of year for marketing your business and improving corporate client relations. The more of an impact you make with the client, the more likely your business will be used for future purchases. Gifts such as these are a small price to pay for keeping your organization in good standing with regular large-scale customers.